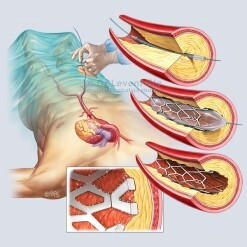 Medical artwork detailing the technique in Robotic CABG. 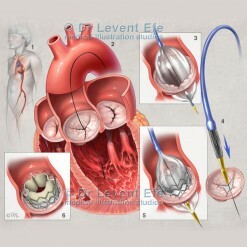 Compared to traditional “open” heart surgery, minimally invasive Robotic-assisted bypass technique offers easier and quicker recovery for patients. 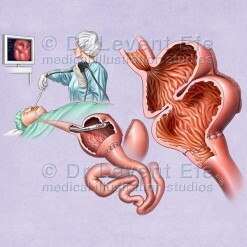 This medical illustration sequence is an ideal tool in educating prospective patients about the Robotic technique. SKU: CT01. Category: Cardiothoracic (CT). Tags: beatingHeart, bypass, bypassSurgery, cabg, coronaryArteries, coronaryBypassSurgery, daVinci, heartBypass, internalMammaryArtery, minimallyInvasiveSurgery, RoboictSurgery. 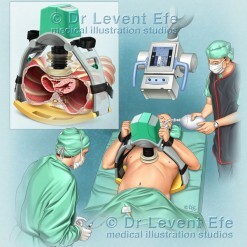 1: Four port entries in this Robotic-Assisted Minimally Invasive Surgery. 2: Surgeon working at the console of the da Vinci System. 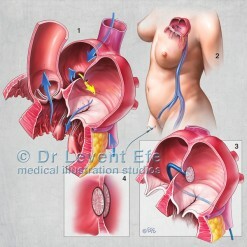 3-5: The Internal mammary artery is dissected and anastomosed to the blocked Left anterior descending artery. 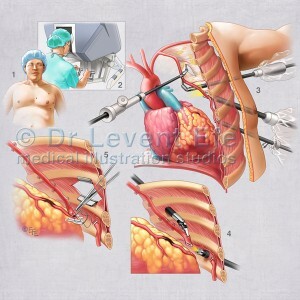 The illustration displays the technique where the patient is not on heart-lung bypass machine, and the anastomosis is performed with a Coronary stabilizer.